Some people accept that punishment is a part of life, and certainly believe that some are deserving of it. Others might be a bit less inclined to believe that most should be punished for their actions. 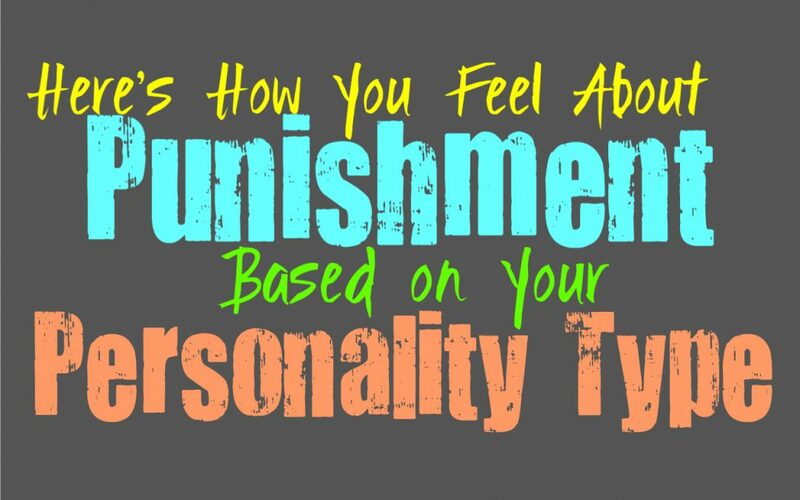 Here is how you often feel about punishment, based on your personality type. INFJs believe in making things right and strive for a sense of fairness. If someone makes a mistake that is small and understandable, then they don’t believe there should be some severe punishment. For them it entirely depends on the severity of their actions and if a sense of justice needs to be reclaimed. If the person has done something truly terrible, then the INFJ will likely believe that punishment is entirely necessary and should be carried out in a way that teaches that person a valuable lesson. For them it is about understanding the situation and the person, since they are forgiving people in most cases. ENFJs do believe that some things require a certain type of punishment, especially since they believe in fairness. ENFJs don’t believe in being harsh and often feel like each situation should be looked at separately. In most situations they want to hear someone out and try their best to understand where they were coming from. Sometimes remorse and an apology is all they need in order to give someone another chance. While ENFJs can be forgiving they don’t simply believe that some people should go on without being punished for their actions. If their crime was severe then they believe they should be held accountable for this. INFPs believe in justice, and so they do believe that punishment is necessary sometimes. For them it is about making sure that the punishment fits the crime, since they want things to be fair. INFPs believe that when someone does something harmful they should be held accountable for this. They don’t think it is right when people skate through without being brought to justice. INFPs are strongly moral people who want things to be run fairly, and believe that justice is extremely important. ENFPs do believe that justice is important, and want to see people make amends for their actions. While they believe that people should be brought to justice, they don’t believe that every mistake deserves punishment. ENFPs believe that people make mistakes and accept that as a part of life, it is often the more serious crimes that they feel deserve more serious punishments. For most errors they often accept that apologizing and working towards fixing their mistakes is perfectly sufficient. INTJs definitely believe that people should have to pay for their actions in life, especially when they do something consciously. They believe in a sense of justice and rules, and those things should be respected. INTJs strive to think before they act, instead of simply tossing out poor decisions without really thinking it through. When someone does something deserving of punishment, the INTJ will certainly believe that it should be carried out. To them rules are important and things should be done with a sense of justice. ENTJs definitely believe in the idea of punishment, and this is because they uphold a belief in justice. ENTJs often feel that it is only fair that there be ramifications for their actions, which is why they think before they act. ENTJs choose to really think things through and come to intelligent conclusions instead of just jumping into something without logical thought. When they do something it is with intention, not simply done in the moment. They often feel that justice is important and people should be punished when they do something deserving of it. While INTPs might not believe that every mistake deserves a serious punishment, they do believe that fairness is important. They want things to be equal, and feel that justice needs to be carried out. Sometimes they can become a bit obsessed with the idea of fairness, to the point where they become frustrated with how uneven things can actually be. INTPs often believe that more severe crimes or actions do deserve punishment, but other times they simply want things to become fair. ENTPs don’t necessarily believe that every mistake or action deserves punishment, and can’t be a little less strict about this idea. They simply believe in a sense of fairness, and that people should be given the same rights and punishments. When someone does something severe they do often feel that they should be brought to justice. With smaller mistakes ENTPs often feel like people simply need to find a way to make up for it, but that it doesn’t mean they deserve some sort of punishment. ISTJs often feel that punishment is an important part of life, and that people need to atone for their actions. When someone does something wrong ISTJs often feel they need to face the ramifications for what they have done. They believe in thinking things through before acting, and that people need to learn to process information doing something foolish. When people continue to go against what is right, the ISTJ does believe they should be punished in some way. ESTJs often believe in punishment, they simply believe that it should be carried out fairly. When someone commits a crime they often feel that their punishment needs to actually match that crime. For ESTJs it is important that people are held accountable for their actions, since they value a strong sense of efficiency. ESTJs don’t make decisions without thinking them through and want to be sure of their choices before moving forward. People who simply jump into the same mistakes can be extremely frustrating for ESTJs. ISFJs do believe that certain actions deserve punishment, but usually this is for more severe crimes. ISFJs believe that most people should be forgiven for small mistakes, and often want to find a way to forgive and move on. They often think that each situations should be looked at and the details should be taken into consideration. ISFJs are forgiving people who want to see others moving on from their mistakes. When someone has harmed others they often feel that those people need to be punished for those actions. ESFJs often believe that each situation needs to be taken into consideration before any sort of punishment should be carried out. They do believe that when someone harms others or does something serious, they need to be punished and should atone for those actions. While they often believe certain crimes deserve a serious punishment, ESFJs do believe in forgiveness as well. They feel that some situations simply deserve an apology and a second chance for that person to make things right. ISTPs often don’t focus on the idea of punishment or fairness, they simply want to look at the facts. If someone commits a crime then they often feel they should be punished, simply because that is how the system works. While ISTPs might sometimes feel that the way people are punished is a bit unfair, they realize that it is simply the way it is. They don’t often want to become hung up on these details, since it can leave them feeling a bit frustrated. ESTPs often do believe in punishment for more serious actions, and feel that people should be held accountable. When it comes to smaller mistakes or things that don’t really hurt others, ESTPs don’t feel that punishment is necessary. They don’t find it easy to always think things through before acting, and so constantly focusing on ramifications seems a bit tedious. ESTPs can have a skewed opinion on punishments, and which situations are deserving of them. ISFPs don’t really believe in harsher punishments, and often feel that people deserve second chances. ISFPs don’t like being hard on others, and prefer to live with a sense of freedom and forgiveness. Constantly having to focus on making things fair and having to carry out punishments, seems a bit pointless to the ISFP. They do believe that when someone actively tries to harm others they should be punished for these actions, but in many situations they seek to find ways to make amends with people. ESFPs can struggle with the idea of punishment, since they don’t often think that far ahead. They believe that people should be able to live with a sense of freedom, and that making mistakes is normal. They often feel that serious punishment for making a few mistakes, is simply overboard. ESFPs care about people and they believe that everyone deserves a few chances to make things right. ESFPs might feel that when someone is constantly hurting others they deserve to be punished, but these sort of negative thoughts can weigh the ESFP down.